This has been a busy week. For my third blogiversary I chose to highlight favorite authors that I have recommended throughout the last three years under different categories -- Historical Romance: Mary Balogh, Fantasy: Elizabeth Bear, Contemporary Romance: Nora Roberts, Women's Fiction/Romance: Lisa Dale. 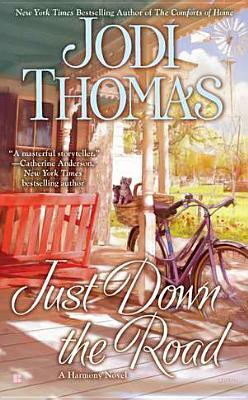 Just Down the Road is the fourth installment in this small town romance series by Jodi Thomas. I'm loving it because Ms. Thomas has a knack for drawing characters with qualities that the reader can connect with easily. That applies to characters that take center stage, as well as to those that play secondary roles within any given book. In this particular installment Jodi Thomas focuses on loses and finding love and hope. There is one very satisfying romance featuring a man who lost his love of life when he lost his wife to cancer, but unexpectedly finds new hope and a second chance at love through the love of an orphaned child and renewed passion when he falls for a woman who has lost her sense of self by trying to please others. Then there are other story lines, one highlighting a much loved young couple going through changes, loss and strife, now finally settling into some sort of understanding, and the other an older couple dealing with doubts and unexpected surprises. 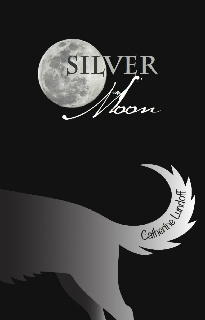 In Silver Moon, Catherine Lundoff weaves a fantasy set in a small town where only a few women are called by magic to change into werewolves when menopausal symptoms flare up. This book's premise is what sold it to me. The story's central character is a woman of a "certain age" going through multiple changes in her life, including menopause. At first glance it might seem as if equating those biological changes with the werewolf theme is dramatic, but in fact I found it to be both creative and on target. Change. Through the theme of change, Lundoff also focuses on other issues that affect women during this time in their lives. She adds insightful touches such as the "invisibility factor"* that women experience after they reach a "certain age," which ties in quite well with the issue of those same women being abandoned or dismissed by husbands or partners (like yesterday's news) for younger women. I mentioned above that the story is about change, but in the end it's really about either fighting those changes or embracing them gracefully when the inevitable time comes. Lundoff serves this fantasy dish with a scoop of hope. While the main character in her story goes through that roller coaster, the other women show the final result: accepting change doesn't mean you have to give up love or sexuality, instead there is much to gain, lots to offer and still great things to come in the future. Alex Jeffers - LGBT Gay Fantasy: Additionally, there is also a free download available here for "Firooz and His Brother," a short story that will be included in Alex Jeffers' upcoming release You Will Meet A Stranger Far From Home: Wonder Stories. I read it and loved it... wonder story indeed. Thank you all for coming by to celebrate this week with me! Great week of celebration, Hils! Happy Blogiversary again and Happy Mother's Day!! Oh, I missed your Blogiversary! Happy Belated Blogiversary Hils!!! Thanks for the link for the Cheryl St. John read. I also have The Wedding Journey on the TBR pile so I'll be sure to read the prequel.